Disney’s breezy update of Rapunzel won’t feel new to anyone who’s seen other recent animated fairy tales (think the Shrek franchise or Disney’s The Princess and the Frog). But the filmmakers have made a lively, funny movie with appealing heroes and a memorable supporting cast. 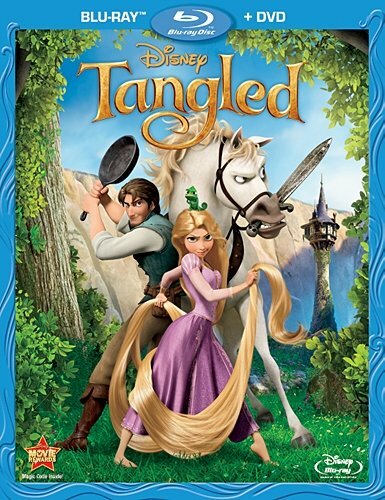 The Blu-ray/DVD combo pack celebrates Disney’s movie history ( Tangled is the studio’s 50th animated feature film), but the bonus features are sparse compared to other video releases from The Mouse. The main elements of the story will be familiar from the Brothers Grimm version — a young woman imprisoned in a tower, a witch, and some really really long hair. In this telling, Rapunzel (voiced by Mandy Moore) is desperate to get out of the tower in time for her 18th birthday. She’s grown up watching the lanterns that her real parents release into the air to mark the anniversary of her birth. As luck would have it, handsome outlaw Flynn Rider (Zachary Levi) stumbles into her tower, on the run from the law and his partners in crime. After recovering from a bonk on the head from Rapunzel’s frying pan, Flynn reluctantly agrees to take her to see the lanterns close up. A series of chases and swash-buckling ensues. Though the movie exists in fairy tale land, its sensibilities are modern. Tangled emphasizes adventure over scary forests and ugly witches, and thankfully avoids pop culture references. Rapunzel’s foster mother, kept attractive by the magical powers of the hair, doesn’t carry the menace of Snow White’s stepmother. Instead she’s a master of passive-aggressive manipulation. She’s as bad as any Disney villain without frightening the little ones. Then there are the ugly thugs who populate the tavern where our heroes hide out. In an unsurprising plot development, we find out through song that this nasty-looking bunch harbors artistic and romantic desires. Luckily, it’s all presented with gusto, and makes for a very entertaining movie for audiences of all ages. Deleted materials make up most of the bonus features. 12 minutes of deleted scenes — actually a series of storyboard drawings with voiceovers — include an open mic poetry night at the pub, and a fortune telling monkey. There are also two storybook openings (storyboard drawings again) and two extended songs with incomplete animation. All of these segments are introduced by directors Nathan Greno and Byron Howard, who provide some context. Untangled: The Making of a Fairy Tale (12:29) consists mostly of Mandy and Zach clowning around and giving out bits of Disney trivia. In between their banter are brief segments about the making of the film. The most fun feature is some teasers made to promote the film. They include fake ads for items from the movie (ultimate frying pan — great for searing, conking and smacking!). The 50th Animated Feature Countdown is a two-minute montage of images from the studio’s 50 animated feature-length films from Snow White and the Seven Dwarfs to Tangled. The DVD only has the deleted storybook openings and the 50-feature countdown. The movie is presented in its original 1.78:1 aspect ratio, with DTS-HD audio. It looks and sounds great. The film was shown in 3D in some theaters and is available on 3D Blu-ray for early adopters. For everyone else, the movie looks just fine on the old-fashioned flat screen. The Blu-ray includes French and Spanish subtitles, and English captions for the hearing-impaired. It also has Spanish and French audio. Before watching the movie, get yourself in the Disney mood by watching the50th Animated Feature Countdown. After the movie, watch the teasers for a few extra laughs.